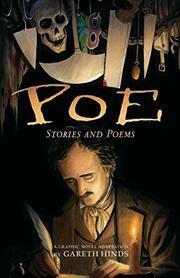 Graphic-novel veteran Hinds turns his astute eye to Poe’s best-known tales. After reimagining many classics including Beowulf, The Odyssey, and a smattering of Shakespeare’s plays, Hinds now takes on the poems and stories of Edgar Allan Poe. In “The Cask of Amontillado,” a dark palette suffused with ominous shadows and fiery earthen reds depicts the unnamed, white narrator as he leads foolhardy Fortunato into his own airless death. Those familiar with “The Tell-Tale Heart” will be delighted to watch the psychological drama unfold as Hinds conceptualizes the famously grisly details while playing with visually striking splashes of color to further accentuate the terror. Hinds also visualizes three of Poe’s poems: “Annabel Lee,” “The Raven,” and “The Bells,” though these poems stray from a traditional graphic-novel format, eschewing panels for expansive, page-filling illustrations with the verse text set against them. At the beginning of each piece, Hinds plainly lays out the recurring thematic elements of horror from his own “Poe Checklist”; for example “The Masque of the Red Death” warns its readers of “death, disease, and scary sounds.” Also included are historical notes about Poe and each vignette, making this volume equally valuable for classroom use or for independent reading.